From the seemingly innocent to the definitely ominous, additives are everywhere. Even if you cook or bake everything you consume from scratch, you’re still adding substances to food that aren’t naturally found in the raw ingredients. And even if you buy products marked “organic” or “all natural,” they are likely to have added preservatives such as tocopherols (vitamin E) or citric acid–found in fruits such as lemons and oranges, and now produced industrially. We add subtances to food that aren’t naturally found in the raw ingredients. And even if you buy products marked “organic” or “all natural,” they are likely to have added preservatives such as tocopherols (vitamin E) or citric acid–found in fruits such as lemons and oranges, and now produced industrially. Artificial sweeteners which are lower in calories than sugar–and cheaper to use. The history of food additives is as old as civilization. Salt, sugar and vinegar were the first preservatives commonly used by cultures around the world, as well as techniques such as smoking and drying. Chemicals have been developed to accelerate or mimic these processes, or as cheaper alternatives to traditional methods. Food colours like tartrazine (E102)can cause mild allergic reactions and some studies show that sunset yellow (E1 10) can cause tumours. Erythrosine is a red food colour. Research has highlighted concerns about its potentialtumour formation and inhibition of the normal functioning of the thyroid. Nitrites and nitrates (E249-52) may convert in the stomach to potentially carcinogenic nitrosamines. Although a definitive link has not yet been established food colours like sunset yellow (E110), quinoline yellow (E104), carmoisine (E122), allura red (E129), tartrazine (E102) and ponceau 4R (E124) have been associated with hyperactivity in some children. These are commonly found in a variety of processed foods, especially in children’s sweets, confectionary, squashes, soft drinks, jams and cakes. Prevalence of hyperactivity is estimated to be about 2.5%. Gums (E412, E414) are used to thicken food and improve texture. Theycan give rise to flatulence and abdominal pain. Keep processed foods to a minimum, including sweeteners, sweets, lollies, soft drinks and cakes. Be careful of foods that are presented as low-fat, sugar-free as they are likely to be additive-rich and nutrient-poor. Every individual reacts differently to food and additives. It’s possible to be allergic to anything–even the most “natural” subtance. If you suspect a sensitivity to anything you eat, try a process of elimination to discover the source of the problem, or consult a practitioner trained in nutrition. If you have concerns about your own diet or that of a family member, and how it may be affecting health, consider scheduling a consultation with us. Artificial sweeteners are non-nutritive, manufactured chemicals with few or no calories. In the UK permitted sweeteners include; aspartame, saccharin, acesulfame potassium (known as acesulfame K), cyclamate and sucralose. We are addicted to the taste of sweetness and the widespread use of sweetener substitutes in food and drink has made our sweet tooth even worse. Unsurprisingly, sweeteners have been found to be responsible for weight gain rather than weight loss. This is applicable even if Aspartame is taken at levels recommended by the United States FDA (Food and Drug Administration). Research carried out in young hamsters found that those on Aspartame tended to eat more and there was also evidence of damage to brain and liver cells. Other studies carried out in rats have also shown that compared to sugar, sweeteners saccharin and aspartame cause weight gain which is unrelated to caloric intake. Researchers have speculated the cause of weight gain to be either reduced energy expenditure or an increase in fluid retention. Breakdown of aspartame produces phenylalanine which is a known inhibitor of a gut enzyme IAP (intestinal alkaline phosphatase). IAP in mice has been shown to prevent metabolic syndrome, a group of symptoms associated with type 2 diabetes, obesity and cardiovascular disease. In another study aspartame was linked to reduced insulin sensitivity therefore affecting blood sugar regulation. The act of eating requires a feeling of satiety and satisfaction. A pilot review suggests that sweeteners only offer partial activation of the food reward pathways in the brain. This may also be responsible for the consequent increase in appetite as an attempt to complete the satiety cycle. Such impaired activation has been observed in obese adolescent girls after drinking milkshake. Intake of artificial sweeteners has a huge contributory effect of our weight gain and obesity problem. Although not immediately apparent, over the longer term it significantly increases the risk of health problems. Convinced that they are doing the right thing many people choose a diet option. Their aim is to try to lose or maintain their weight but ironically it is causing just the opposite. The dangers of sweeteners need to be acknowledged by the public health sector and the food industry. Introducing manufactured substances into our body in the form of artificial sweeteners, additives, preservatives and in many other commercial products has a major influence on our body’s chemistry, creating a chemical disaster equivalent to a tsunami. The human body is not made to digest artificial foods that may look and taste similar and nutritionally they can never replace fresh natural foods. Birchfied Big Local recently conducted video interviews of clients and their views on the service. At the Integrated Health Clinic cases of pain caused by nerve compression are quite common. Most present with severe almost agonising pain. There is limited or very little relief from pain killers, they are unable to sit, lie down or walk without discomfort, unable to adequately perform daily activities, have to take time off work and a good night’s sleep has become a distant memory. Where the problem is muscular Acupuncture can be used effectively for pain relief, reduce inflammation and easing the muscle spasm. Acupuncture works by stimulating the ‘Qi’ (vital energy) to flow properly within the impaired qi pathways known as ‘meridians’. Needles help to release neurochemicals such as endorphins which change the way pain is processed in the brain and spinal cord, as well as release of vascular and immunomodulatory factors that reduce inflammation. As a standard the clinic also uses heat treatment some soft tissue manipulation such as massage or cupping to reduce soft tissue constraints, tension and enhance blood flow. Our experience shows that a combined integrative treatment approach greatly enhances the overall outcome. After suffering from agonising and tearful shoulder pain, a client recently received a combined acupuncture and massage treatment, along with electro-acupuncture which involves the use of electrical needle stimulation. Not only did their pain symptoms and numbness significantly improve but they were pleasantly surprised that their mood was considerably uplifted. Their feedback was…. “I feel so much happier”. This is a welcome and inevitable effect of acupuncture, confirming results from many scientific studies that it benefits not just the physical but also the mental and emotional. To learn more about how acupuncture or a combined treatment can help you, call or book an appointment. YES, You Can Control Your IBS ! If you are struggling with your Irritable Bowel Syndrome symptoms (IBS), don’t give up just yet instead, Take back control ! IBS is a functional disorder athat affects the colon and causes irritable of the lining of the colon. Symptoms can include; diarrhea and/or constipation, bloating, gas and abdominal cramps. Whilst a small proportion of sufferers need to take medication, most people can control it with dietary changes. Studies have shown that avoiding certain foods can help to reduced severity and fewer symptoms, with much improvement in quality of life. Have regular meal times, chew well and avoid eating in haste to help the process of digestion. Drink at least 8 cups of fluids a day. This can include water, soups, herbal or non-caffeinated drinks. Regular exercise has shown to help reduce symptoms. Benefit can be had from gaining advice on nutritional supplements e.g. multivitamins, essential fatty acids and probiotics to remedy any nutritional deficiencies that may have resulted due to prolonged IBS symptoms. Complementary therapies like acupuncture can help to reduce symptoms and calm the digestive system. It is particularly effective for functional problems. It can also help to reduce stress caused by a busy and demanding lifestyle. Avoid or restrict drinking tea, coffee, alcohol and fizzy drinks. Start to keep a food diary and when symptoms occur. This will help to identify problem foods. Avoid or limit foods that may worsen symptoms. If you have persistent or frequent bloating, a low FODMAP diet can help. 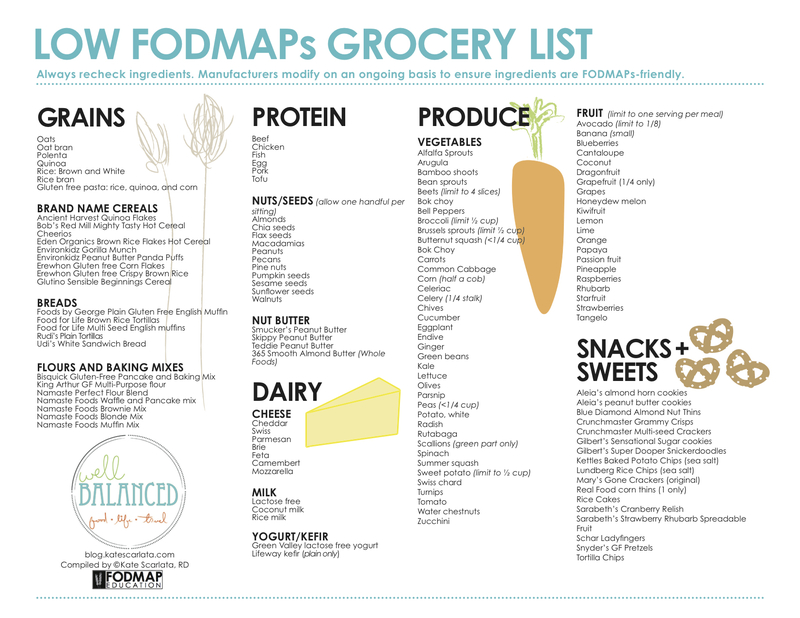 FODMAP stands for fermentable oligosaccharides, disaccharides, monosaccharides and polyols. Essentially these are carbohydrate, but specifically FODMAPS are certain types of carbohydrates that are not easily broken down and so have difficulty being absorbed by the gut. Left undigested in the gut they quickly start to ferment to release gases resulting in bloating. Low FODMAP diet essentially involves restricting your intake of high FODMAP foods e.g. some fruits and vegetables, animal milk, wheat products and beans. There is a danger of eliminating too many foods, potentially impacting on general health. Thus seeking guidance from a knowledgeable professional will ensure that you maintain a healthy balanced diet. You can read more about the low FODMAP diet here. When you are actively experiencing IBS symptoms it can seem like you react to almost everything that you eat. Often people may have eliminated food that they are able to eat if their colon is not in a reactive state. Thus, after a minimum of 3-4 weeks of food avoidance or limitation, the colon will have rested and calmed down. At this time you can start to can bring back foods one at a time at a rate of one item per week. You might be pleased to discover that you’re only sensitive to one or two FODMAP carbs, not all of them e.g. wheat is a problem but dairy is OK. The aim is to find out what foods or other factors (e.g. stress) trigger your IBS symptoms. In this way you can create your own personal diet which gives you all the nutrients you need but only includes the foods that you can handle. Majority of the time there is no single reason for back pain, and similarly there may not be one single cure. Lower back pain is one of the most common complaints that present to the GP or to practitioners of complementary therapy such as massage, acupuncture, osteopathy or chiropractic. Around 95% of acute low back pain is non-specific and may have been caused by bending the wrong way, lifting something heavy or aggravated by other conditions like arthritis, hairline spine fractures, spinal disc degeneration, kidney infections, cancer and others. Regardless of the cause back pain can be extremely disabling and almost everyone can expect to experience it at some time in their lives. There are times when back pain is clearly serious, particularly when it is associated with numbness, weakness or tingling in the legs. In such cases a visit to the doctor is a must. But for other more routine low back pain there are a few tips which can be tried at home. Ice or Heat ? : If you have physically injured the back by banging it then in the first 24 hrs cold packs can help to dull the pain and reduce inflammation. However after this, heat and particularly in the case of chronic back pain heat is the treatment of choice. It improves local circulation, relaxes the muscles and eases pain. Muscle spasms and trigger points respond better to heat. Have a hot soak: If more than 24 hours have passed since the injury occurred, ice will not help reduce pain or inflammation. Try soaking in a tub of hot water for 20 minutes or more. This will help ease the muscles and help you to relax. The addition of epsom salts will reduce inflammation. Keep moving: Keep mobile, but don’t overdo it. The spine likes movement and the worst thing you can do is stay still so carry on doing your daily activities as much as you can. Release Body endorphins: Our body naturally produces endorphins which help block pain signals. Endorphins also help to alleviate stress, anxiety and depression, which have been linked to worsening of chronic back pain. Some feel good measures include; meditation, aerobic or stretch exercises. Therapies like acupuncture and massage stimulate the production of endorphins. Emotional health: There is increasing evidence that our mental state and the ability to address stress determines whether we are able to more effectively mange pain. Back pain and other types of pain can be exacerbated by psychological and emotional issues. Complementary therapies can be useful to manage stress. Chamomile and ginger: Chamomile is a relaxant, whilst ginger has anti-inflammatory properties. Fresh ginger sliced (2-4) or grated boiled in two mugs of water until it is reduced to half the original volume will make a delicious and fragrant tea. Honey or sugar can be added for taste. Drink this 2-3 times a day. Grated ginger added to your vegetable juice is a good idea as well. Restorative sleep: Inadequate sleep aggravates back pain and enhances recovery. Sleep on a firm surface on your side to reduce any curve in your spine. Changing your sleep posture can also be helpful. Massage, Essential oils & Complementary therapies: Self massage (or from a trained professional) and using essential oils can help your muscles relax and relieve pain. Essential oils such as eucalyptus, camphor and black pepper blended in almond or grapeseed oil have muscle relaxant and anti-inflammatory actions. Complementary Therapies like acupuncture, osteopathy, chiropractic, Alexander technique can also be very effective. Pepper pain relief: Capsaicin (pepper) cream or ointment containing 0.075% or 0.025 capsaicin applied on the pain surface can help alleviate pain. It may take a few weeks for the full effects to be felt. Capsaicin acts by desensitising the sensory receptors in the skin by depleting the body’s supply of substance P, a chemical substance in nerve cells essential for the transmission of pain signals to your brain. Hence lower levels of substance P in the circulation reduce the pain sensations. Posture: Modern lifestyle makes us spends more time sitting down, whether it’s at work or home. Long periods of sitting or static positions can be more harmful when you have back pain. Sitting properly can minimize these effects. Avoid slouching. Correct posture in a chair means having all the bones in your spine lined up neatly, like a stack of perfectly aligned blocks. This means keeping your feet flat on the floor and your computer keyboard within easy reach so you’re not leaning forward. This is one part of proper office ergonomics. Stretch: Don’t just sit or lie down. If you have a stretching routine like yoga then do it every 2-3 hrs. The body muscles and bones are all interconnected so a whole body stretch is important. A few simple stretches are;Overhead stretch: Lie on your back with arms on the side. Slowly raise your stretched arms overhead and stay in the position for 15-30 sec. Next, gently pull one knee as close as you can to your chest again stay in this position for 15-30 sec, and release the leg back to its original position. Do this with the other leg. Repeat 5 -10 times. Knee-rolls: Lie down with your arms stretched to the sides bend your knees and roll the knees to one side. Hold the stretch for five breaths and then return it back to the middle. Do this on the other side. Repeat 5 -10 times. Structural decompression: Structural decompression helps to improve posture and eliminate back pain. When done properly it helps to lengthen the hip flexor muscles and stabilize the spine, thus supporting the core abdominal muscles. Overall, this strengthens the back and lifts and opens the chest. Below is a video of yoga postures for structural decompression. Almond milk is one of the dairy free options that can replace the use of milk. Making almond milk is actually not a new thing that has come out of the gluten-free or dairy-free world. It is readily available in the shops, but you can easily make it yourself at home. Simple homemade almond milk is real, fresh, creamy and delicious. The best thing is that you can customise it to your own taste. It can be used with cereals, for baking and a variety of drinks. You can also make almond yogurt. 1 cup raw almonds, soaked in water overnight, or for up to two days. Soaking for longer periods will give you a creamier milk. 2 cups of water. This will give you approximately a consistency of 2% milk. You can adjust this to make it thicker or thin consistency. Drain and rinse the almonds and put it in a blender together with water. Blend the mixture for up to 2 min at high speed to get a smooth nut-milk mixture. With clean hands strain the nut-milk mixture using a clean thin cheese cloth or thin dish towel. Lay the cloth over a mixing bowl, pour the mixture on the cloth and carefully gather the four corners. Lift the cloth and squeeze the cloth to force out the milk leaving behind the almond pulp. You can use the pulp in smoothies, cooking or baking. Fill the milk in jars or a covered bottle and refrigerate. For added taste you can add the vanilla extract, salt or even make other flavours by blending in fresh strawberries or banana. Almond milk will generally keep for up to 2 days, but you may find that it tend to separate. Therefore share well before drinking. If you found the above useful then you want to explore how to make almond yogurt through the links below. Do-It-Yourself Homemade Almond Milk Dairy-Free Yogurt.